Founded in 1984, the Sonoma Valley Visitors Bureau (SVVB) is a nonprofit organization representing more than 350 member businesses that serve and support the local hospitality community. Our two visitor and retail centers— at 453 First Street East on the historic Sonoma Plaza, and at 23570 Arnold Drive at Cornerstone Sonoma on Highway 121—are open all year, seven days a week. In addition to a professional staff, more than 50 community volunteers help welcome visitors to the Valley. 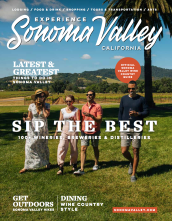 For assistance in planning your next visit, order a visitors guide, call 707-996-1090 or toll free 866-996-1090, write info@sonomavalley.com, or mail your request to 453 First Street East, Sonoma, CA 95476. Use the Sonoma Valley Visitors Bureau online event submission form to submit your Sonoma Valley event. Click Here to submit today!